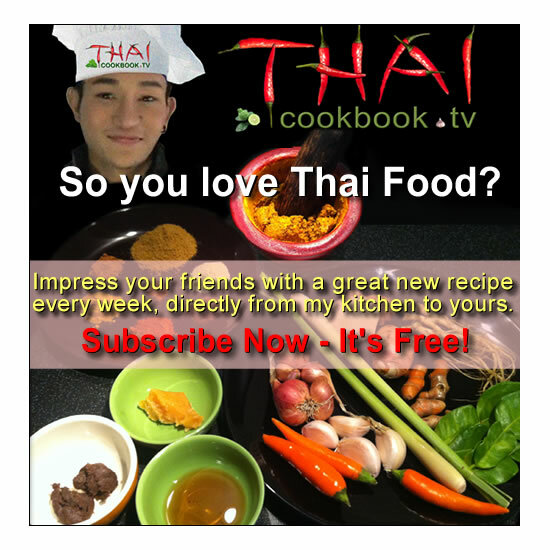 Panang curry (พะแนง) is a type of Thai curry that is generally milder than other Thai curries, making it a very popular choice for people who don't normally like spicy foods. 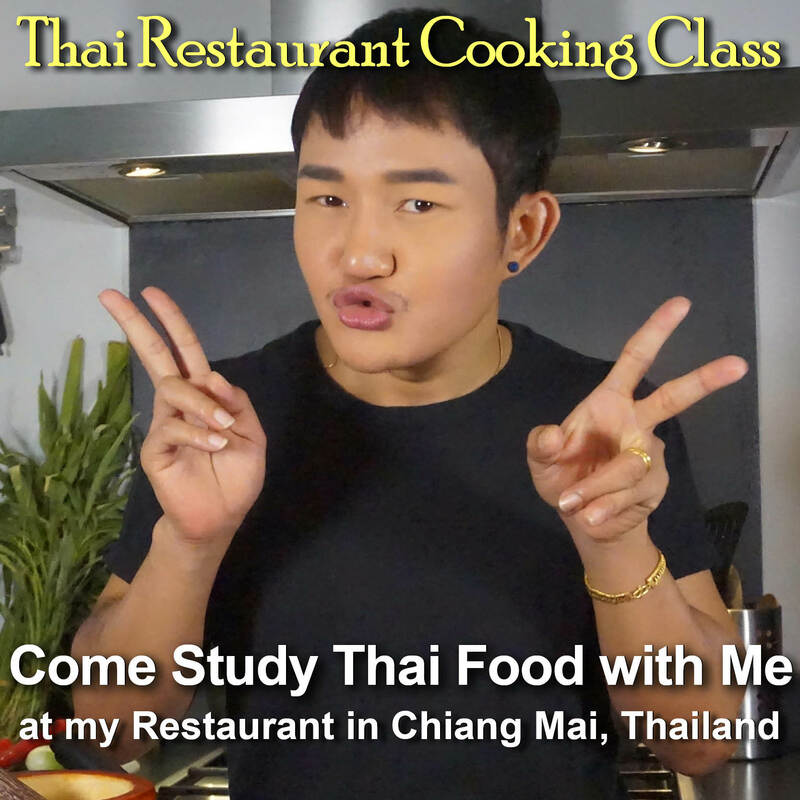 This recipe is pork panang, which is thin sliced pork tenderloin in a curry and coconut sauce with pea eggplants, basil, and mild chilies. It contains thick coconut milk and has very little other liquids added. For this reason, Panang curry is often referred to as dry curry, meaning that it is not a soup like some other curries. The dish can also be made with beef. For vegetarians, tofu can be used in place of meat. Panang is most often prepared with just the meat and curry sauce, served over rice, making it a rather plain looking dish. We really like this version uploaded by Khun Worawut. It's packed with pea eggplant, mild chilies, and basil, making it a delicious bowl of "stew" that can be enjoyed the traditional way or eaten directly from the bowl with a spoon. What's in our Panang Curry with Pork. How we make our Panang Curry with Pork. 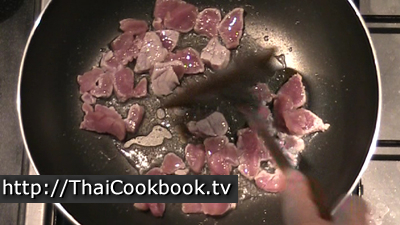 1) Slice the pork tenderloin into 1/4 inch thick slices, then fry in hot oil until all sides a well sealed. 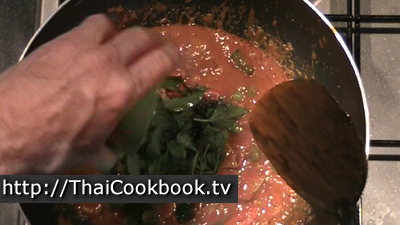 2) Add the coconut milk, curry paste, sugar, and fish sauce to the pan. Let it cook until all the sugar and paste has melted in and the mixture is a nice golden brown color. 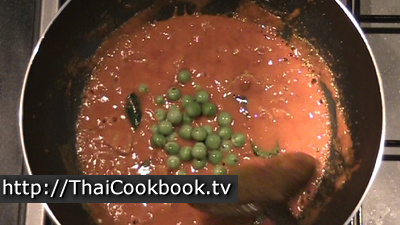 3) Add the kaffir lime leaf pieces, pea eggplant and mild chili peppers. Let it cook for 5 minutes. 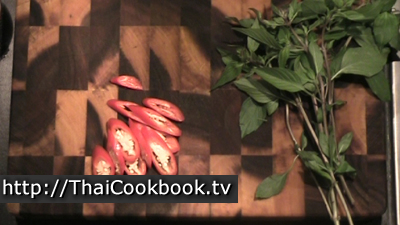 4) Turn off the heat and toss in the basil until it is wilted just a little, then serve. Strip the stems from the kafir lime leaves, and break them into smaller pieces. Take 2 leaves and slice them into very thin strips to use as a garnish. Slice the long mild chili diagonally. Clean the basil and remove the leaves and flower tops. Save a few nice top pieces to use as a garnish. Slice the pork tenderloin into 1/4 inch thick slices. Heat a wok or frying pan. Add 1 Tablespoon vegetable oil and let it get hot. Add the pork and fry quickly until all sides a well sealed. 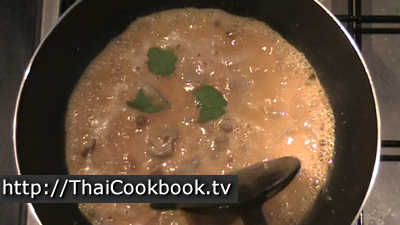 Add the coconut milk, curry paste, sugar, and fish sauce to the pan. let it cook until all the sugar and paste has melted in and the mixture is a nice golden brown color. Add the torn kafir lime leaf pieces and cook for a couple of minutes. Add the pea eggplant and mild chili peppers. Let it cook for 5 minutes. Turn the heat off, then stir in the basil leaves just a little until the are mixed in. Remove from the pan immediately. Serve in a small bowl. 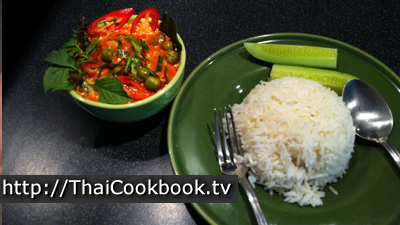 Garnish with sweet basil leaf and flower tops, red chili, and kafir lime leaf slivers. 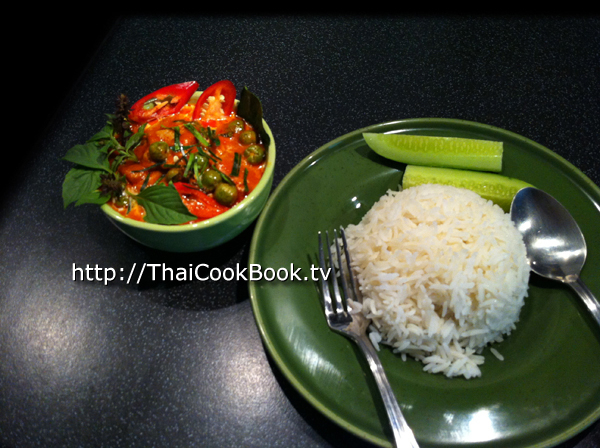 Serve with a plate of steaming hot Thai Jasmine rice, and cucumber wedges n the side.